If you sign in from the Zanata homepage, the first screen you see will be the user dashboard. 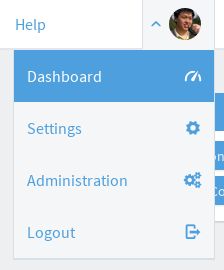 To get to the dashboard from another page, expand the user menu on the right and click Dashboard. At the top left, you will see your profile picture, name and username, as well as a link to user settings. The activity stream is on the Activity tab on the left of the dashboard. It aims to show recent activity relevant to you. Translations you have done. This includes links to the project, version, language and document that was translated. There is also a link to the last translation of a batch, so you can easily pick up translating where you left off the previous day or before a break. Reviews you have done. This will include similar information to translations. Documents you have uploaded recently. This includes links to the project, version and document. The icon to the right of each item shows the type of activity - document uploads have a document icon, translations have a globe icon and reviews have an eye icon. If you have more recent activity than is shown in the activity stream, you can see more by clicking more activity at the bottom of the stream. In the Project tab, a list of your maintained projects is shown. 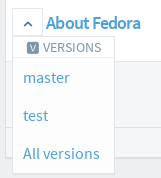 The down arrow to the left of the version can be clicked to show all the versions for the project. The project name, version name link directly to the project page, version page respectively.